Kimchi (a.k.a. 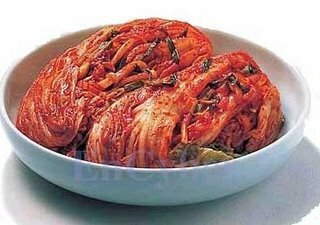 kimchee) is a raw, pickled vegetable concoction indispensible to Korean cuisine. Kimchi usually includes tiny fish or shrimp. Wanting a vegan version, I decided to learn to make it myself. I've found that this spicy fermented side dish is quite easy to make, and will keep for many weeks in the fridge, slowly growing tangier. 1. Discolored outer leaves and the root of mature whole cabbage are removed. Cut each cabbage lengthwise into two section. 2. The cabbage sections are soaked in a brine with 10 cups of waters and a cup of salt for 2-7 hours until softened. 3. Rinsed in cold water, and then drained. Cut one-third of radish into thin strips. Cut green onions,the watercress stems and Indian mustard leaf into 3/4 length. 4. Crushed garlic, crushed ginger, the salted shrimp juice, hot red pepper powder,and seasonings are blended together. 6. Blend every stuffs but cabbage.The blended stuffing materials are packed between the layers of leaves,and the stuffed cabbage are tightly stacked in a jar. The amount of salt to be added controls the rate of fermentation.kimchi to be consumed during the winter has less salt than those prepared during the spring. The rate of fermentation is also affected by temperature.